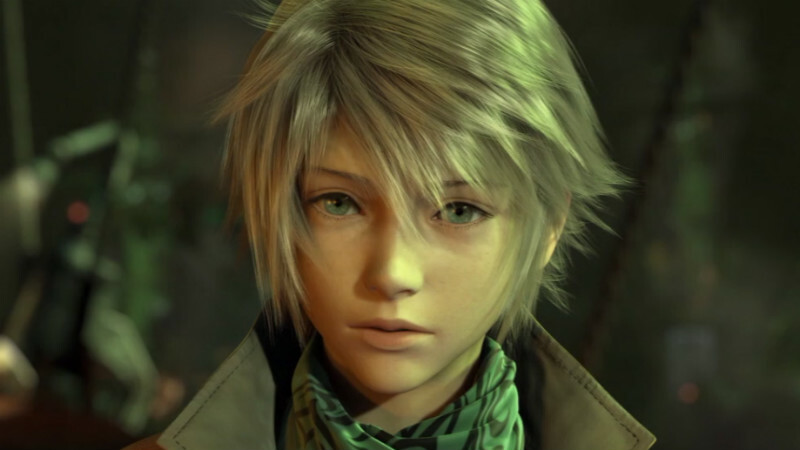 When people ask me what my favourite game is – which happens a lot given that I write about video games – I often tell them “Try not to hate me if you’re a Final Fantasy fan,” as I proceed to explain to them that Final Fantasy 13 (FFXIII) is my favourite game of all time. I give the warning because I know it is the black sheep of the Final Fantasy franchise and many people do not like it. But as of today, I think I’m going to stop doing that, because it’s not like I’m ashamed of what I like, and because the Final Fantasy franchise has all different kinds of games. 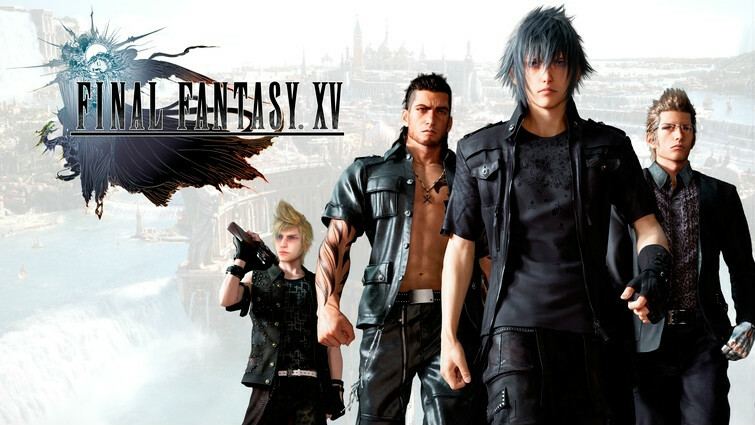 There is, however, one big reason why I’m going to stop warning people.The newest mainline game in the franchise – Final Fantasy 15 (FFXV) – is widely loved and considered a fantastic game, and to be quite honest, I have no idea why. I feel as though Final Fantasy 15 is much more guilty of the aspects that fans criticize Final Fantasy 13 for. I’m going to go through some different aspect of both games and compare and contrast them so you understand where I’m coming from. Probably the most obvious thing that FFXIII is disliked for is the fact that it is extremely linear. A lot of people even call it the “endless hallway game” due to only being able to progress forwards through the story, with no branching paths, towns to explore, or side quests to due until the last quarter of the game. FFXV is the opposite. Almost instantly, the game opens up and you can walk, drive or ride chocobos to most places, hunt monsters,or do side quests. These are two very different gameplay styles, one of which is not very popular in a gaming community that loves open world games. First, I would like to point out that FFXIII’s gameplay structure fits with its stories tone and pacing. 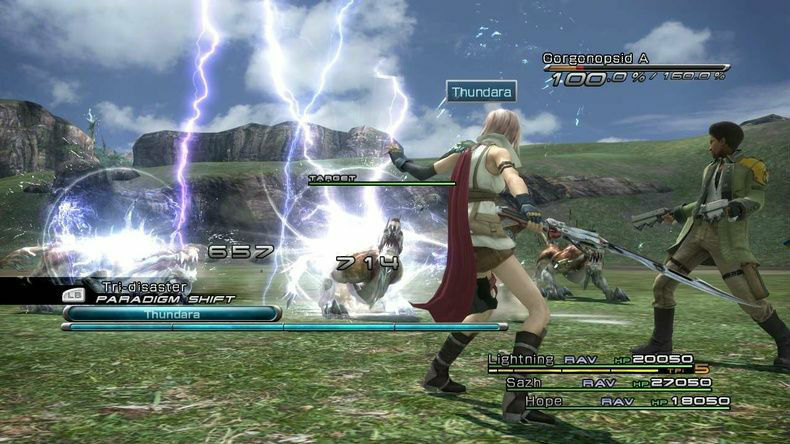 Lightning and the gang get turned into l’Cie early on in the game, becoming enemies of the people and government. From that moment on, they are constantly hunted and always have the threat of capture or death licking at their heels. Why would these outcasts go “visit a town”, sleep at an inn, or talk to NPC’s to then help them with their problems? They are literally ticking time bombs that may become mindless demons that live for thousands of years in sorrow. Personally, I wouldn’t be wasting time to help strangers with stupid fetch quests or something like that. There’s also the fact that their government immediately exiles anything or anyone to do with fal’Cie or l’Cie, so meeting and talking to strangers would pretty much be a death sentence for an otherwise innocent civilian. My point is that the game’s structure of being linear and basically being “fight, run, fight, run” is in sync with the narrative. Even if you don’t enjoy this type of gameplay, regardless of if it’s fun or not, it’s consistent with the theme and plot structure of the game. A huge theme of the game is whether or not these characters have free will and if they’re able to influence their fate. For a large part of the game, it’s doesn’t seem like they do, or that they even have the luxury of time to think about it. The characters then realize they do have free will and the chance to change their fate, and then the game opens up like it does in Chapter 11. This proves that the narrative structure and gameplay linearity go hand in hand. Now, let’s look at FFXV, a huge open world game with towns you can visit, NPC’s to talk to, and even a few mini games. You get to drive around with your 3 best buds and go hunt monsters, buy a new weapon, get a quest where you go hunt monsters, or maybe go to the local diner where they give you more quests to go… hunt… monsters. I’m sensing a theme here. Oh! I know! Maybe take a break from the typical monster hunting and go fishing, which literally every other major RPG has and tends to be fun for about 5 minutes. FFXV is an open world game that feels very empty because there is nothing to do and the side quests are literally nothing but hunting monsters. Why are people satisfied with just the concept of an open world, if there is nothing to do in said open world? I get that all of FFXIII’s side quests are also battles, but it’s not an open world game, there are no NPC’s or side characters to interact with. FFXV’s open word formula would work if this game was made 25 years ago like some of the first few game were, but RPG’s have a higher standard now. Just simply being open world does not cut it. I know that there is also Justice Monsters Five and Totomostro, but these hardly qualify as a good “break” from traditional gameplay. 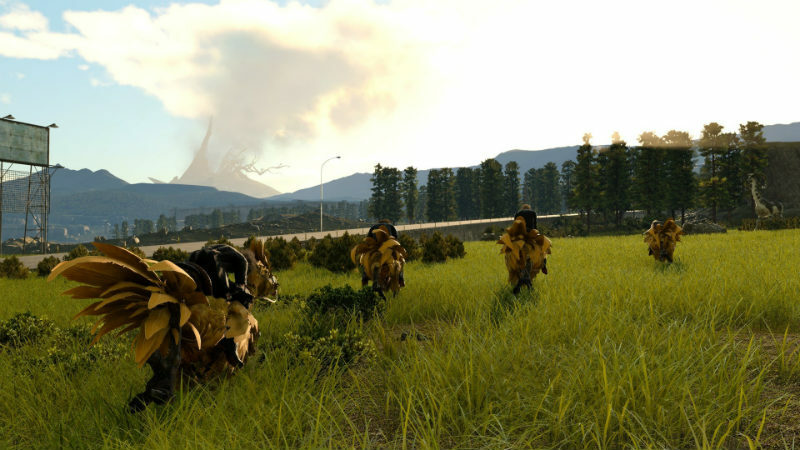 There is urgency in FFXV’s story, but that immediately goes away when you can take a 10-day camping trip and do nothing but fish and ride chocobos everywhere. The story structure and overall gameplay structure are not consistent. Even if you factor in Noctis’ need to “get stronger,” then he would just have to rush to get all the royal weapons, but nope; let’s go kill some level 2 birds who are terrorizing the townspeople. Also, what is so fun about going to the same kind of towns, talking to the same generic NPC’s, and going to the same generic shops to get better gear? 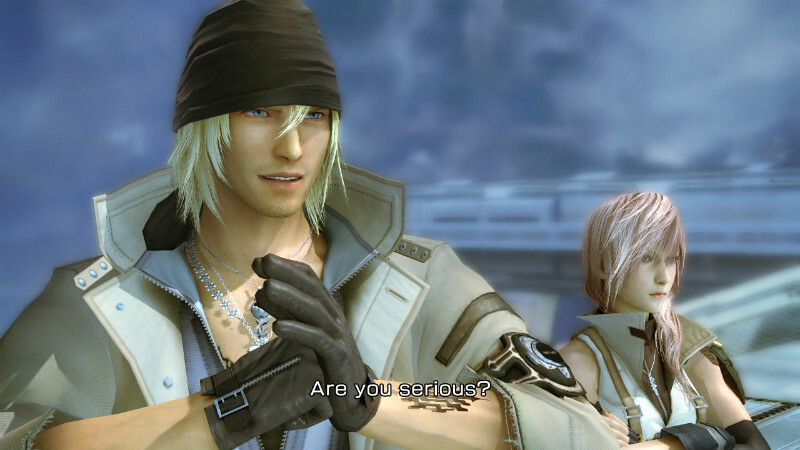 Why are people complaining about not being able to go to towns in FFXIII, when they are so damn boring in 15? You want interesting cities with cultures, varying locales, shops and NPC’s? Recent Final Fantasy games are not for you, go play The Witcher 3 or Skyrim. Another thing that people give FFXIII flak for is its characters, their goals, character development, and relationship with one and other. Now, I’m going to throw critics a bone: I understand their reasoning for thinking this way. Hope, Snow and Vanille (mostly because of all the weirdly sexual noises she makes) can at times be annoying characters. Some of the characters goals and desires do change two or three times throughout the game, and some character relationships aren’t very good storywise. But I’m still going to go through them and discuss why each aspect isn’t as bad as people make it out to be. Everyone knows that combat is one of the most important part of any RPG. The creators have to make it fun, as it’s probably the thing you’ll be doing most in the game. Both FFXII & FFXV have a very different ways of going about this, one being more turned based, and the other being action oriented. 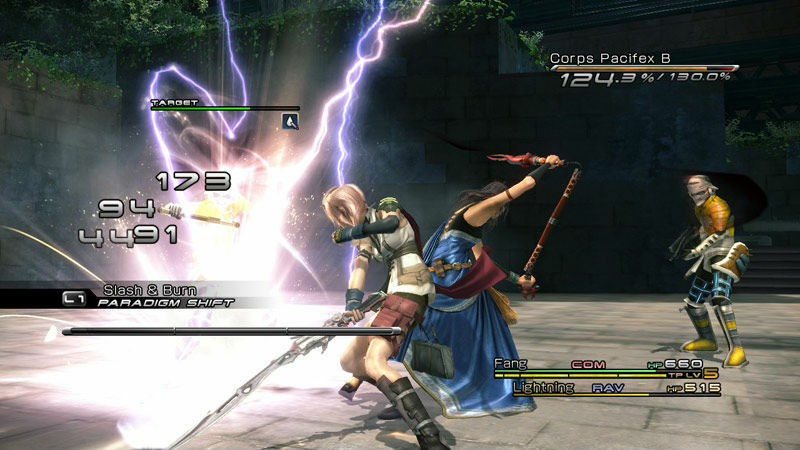 Final Fantasy 13 focuses on changing your party’s role in the middle of battle in order to combat the enemies you face. Each enemy might need a different paradigm deck than another, and each individual role is incredibly different from the others. 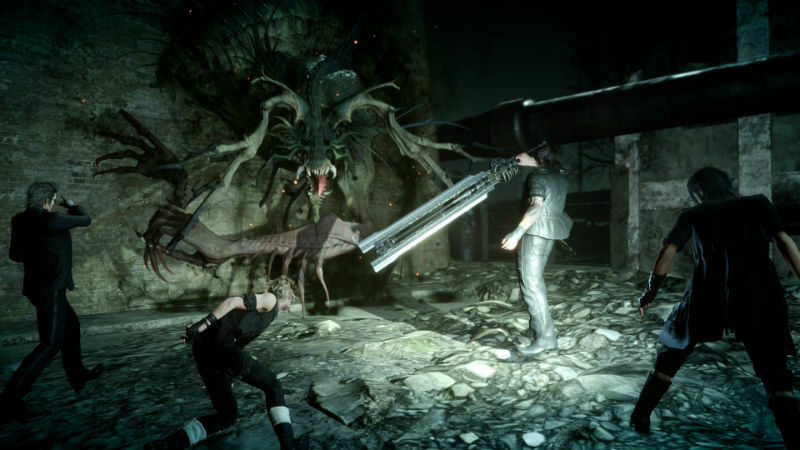 In Final Fantasy 15 you only get to control Noctis, who has the ability to wield every kind of weapon including legendary ones that do a ton of damage. The game has a heavy emphasis on his ability to warp, as well as dodging enemies’ attacks in real time and then blocking and parrying their attacks. These are two very different battle systems, each with its own positives and negatives. FFXIII is probably criticized the most for it combat system. I understand if you don’t like turn based combat (even though FFXIII isn’t fully turn based) because it is not for everyone, but that doesn’t mean it is bad in any sense. Throughout two thirds of the game, for story purposes, the game chooses who you play as and who your party leader is. While I understand that people may have wanted to play as all of the party throughout most of the story, as well as choosing who your party leader is, I really don’t think the story would have worked at all. And because you often only play as two or three characters without having the ability to play as the other three, it led to the developers being able to make boss battles – and just regular battles for that matter – have more strategy due to most characters only being able to use certain roles throughout the story. This is also the case for later in the game when you get to choose who your party members are and who your party leader is. In the next section, I’m going to quote a few different Final Fantasy experts because I don’t think there is any better way for me to say it. What this means, is that just like other Final Fantasy games, all the characters can eventually master all of the roles in the game. Throughout the story, however, each role is given to specific characters at different times and in different order. In chapter 10, all the characters get access to all of the roles, but the 3 roles that they didn’t specialize earlier on cost a lot more CP (EXP) to level up in. Even characters who specialize in the same roles might learn the moves in a different order. 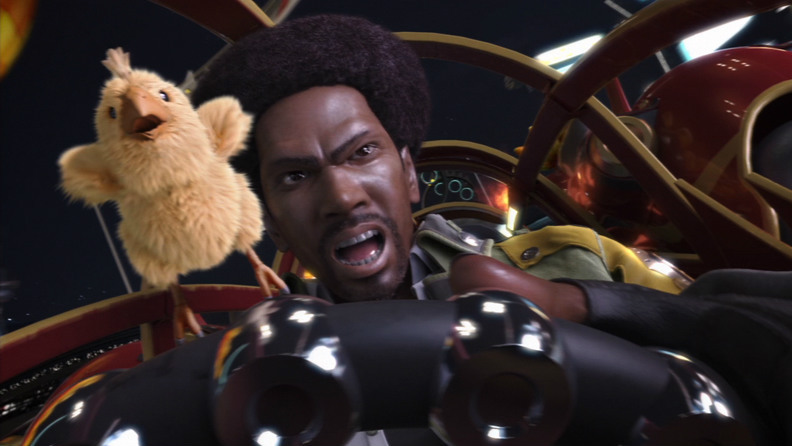 For example, Sazh and Hope both have access to the Synergist role early on in the game, but Sazh learns offensive buffs first, such as Haste, Faith and Bravery; whereas Hope learns Protect, Shell, and the Bar buffs first. Because they are both your 2 best Synergists, they learn most of the buffs in the game. 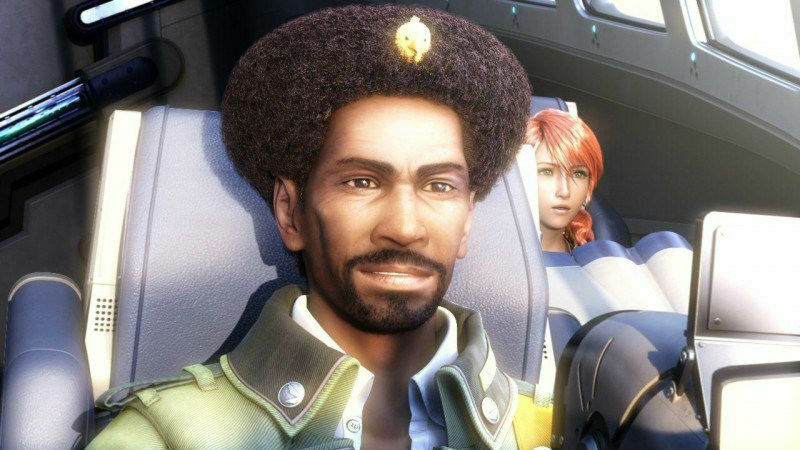 The only exception is Sazh learns Vigilance whereas Hope does not, and Hope knows Veil whereas Sazh does not. Some characters take it much further. Lightning, for instance, does not learn any of the defense boosting moves that the sentinel role has to offer such as Steelguard, Mediguard, or Vendetta, whereas Snow and Fang do because it is their main role and they’re simply more proficient with it. I think it should be noted that FFXV has absolutely no different roles, job, or classes that the main cast get to choose from. All 4 of them act pretty similarly except for the fact that you can issue a command for them to use a special move, and you’re only allowed to have one of them assigned to each character. Gladio, Ignis and Prompto feel useless because you have no control over how they act and Noctis -the player controlled character – can use all of their weapons with more speed and control. 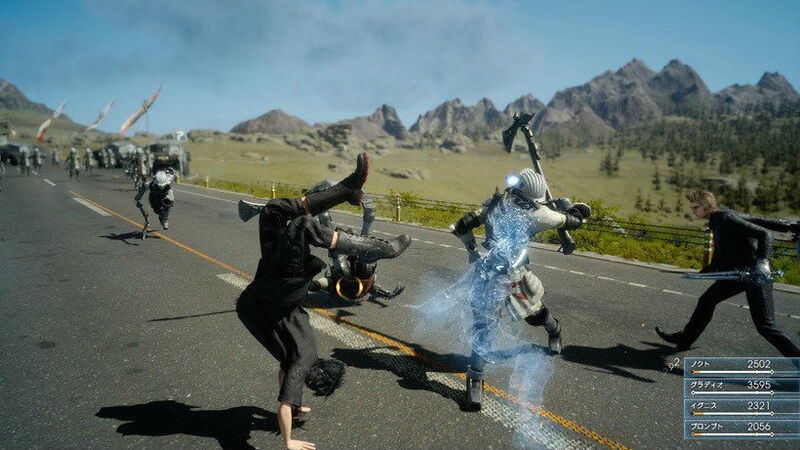 You can now switch between characters(which will cost you EXP) but even still, Noctis is much more useful in combat seeing as he can use a wide variety of weapons and the ability to warp. They don’t even heal themselves whenever they get badly hurt, or even downed, they wait until the player chooses to heal them. Even though you cannot play as the other 2 characters in your party in FF13, you still have great control over the roles they play and the A.I, despite being mandatory, is quite useful. One of the most prominent comments that you’ll hear about FFXIII is that you just have to “press X to play/win” which is probably the most untrue criticism of it that I am constantly arguing with people about. Yes, by setting your default paradigms, you might be able to get through a few chapters very early on in the game – which would take a lot of trial and error, as well as just making the game incredibly tedious and boring – but you can only do this until a certain point. YouTuber Sorozone does an experiment in which he tries to get as far into FFXIII as he can by just pressing the X button. He does eventually get to the Odin boss fight in chapter 4, but I assure you that he does this by exploiting a few game mechanics, through extreme trial and error, and by pushing paradigm optimization to the extreme, proving you cannot just press X to win. The combat is much more deep than that, requires much more attention, and can be more engaging the more efficient you want to be. Before I take an even deeper dive into the FFXIII combat, let’s contrast it to XVs. Like I mentioned earlier, XV has no roles or jobs for the players to choose from, and you only play as Noctis (at least I did through my journey, since I played the game at launch. You can now change characters, but it really doesn’t do much). The combat is incredibly easy to control and play, square is dodge, circle is attack, and triangle is to warp. This sounds simple and easy to follow right? Yes, but that’s it. Combat is extremely – childishly, even – easy. If you hold down the square button, you instantly dodge any and all attacks. Dodging takes MP but as soon as you warp away from combat for two seconds, your MP automatically fills back up. I played FFXV last night just so I could get a real refresher on the combat for writing this article. I did a mission where I had to kill some Tonberry Kings late at night. I got to the quest area and started the battle. My enemies were about 15 levels higher than me, and it was clear they were supposed to be able to kill be in about two hits… but they didn’t. Anytime I thought they would attack, I just held down the square button and dodged their attacks. Most of the time, after dodging, I would get the quick time event where I had to block an attack, and then parry, which meant they would stagger backwards and stop attacking. If I ever got low on MP, I’d just warp to a safe point, and if by some miracle the enemy hit me and did a lot of damage, I’d use one out of the hundreds of restorative items to instantly get my health up all the way. The game makes it very clear that this was supposed to be a hard fight, but not once did I feel that way. It had been over a year since I last played FFXV, I barely remembered the controls and the mechanics, but it was just such an easy, stress–free fight, that there was absolutely no challenge and I really didn’t have that much fun doing it. There was no strategy, I didn’t need to optimize my party for the fight, and it felt like my comrades were doing nothing but taking the aggro off of my character so I could just warp away. Again, just to prove how easy this combat is, I did another quest after this one where the monster was supposed to be even tougher than the last. As soon as I entered the fight, I accidentally got hit and my health went down to zero. Within 5 seconds of this fight, I was than able to summon Leviathan and he killed the monster I was facing almost instantly. How is this fair? How is this satisfying? I didn’t do anything. No enemy is hard or scary to face in this game. The combat is probably the weakest part of FFXV. Like I mentioned earlier, FFXIII’s combat is much more deeper than most people give it credit for, and has a lot of attention to detail. 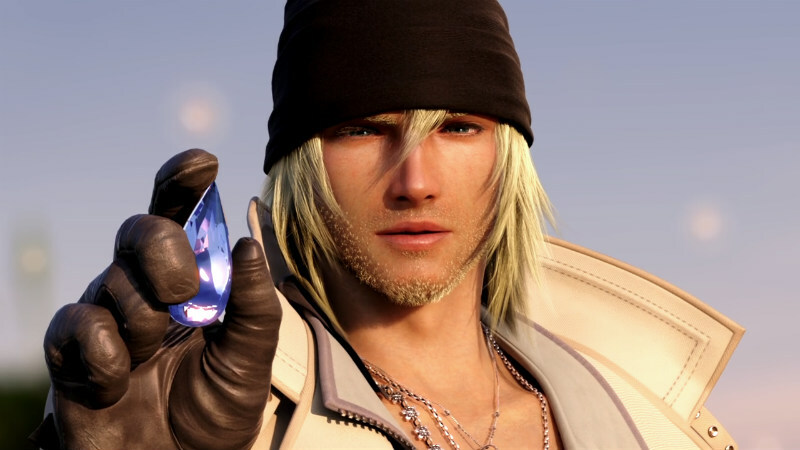 To once again quote Mrzwaznig, he has this to say about the combat system in FF13: “The reason I think many people find the battles in FFXIII unengaging is because the game does not do a good enough job of incentivizing efficient play. Simply put it is easy to fall into the trap of COM/RAV/RAV to stagger, COM/COM/RAV to kill, COM/RAV/MED if low on HP… Playing ultra defensive or without much regard for efficient buffing and debuffing will get you through most of the game, but the battles will take a long time and be far less engaging if you do. A friend of mine once described the problem as: FF13 is a game that has a lower skill floor to beat than it does to enjoy it“. This is so unbelievably true. At the beginning of the game, when you learn about the different roles, the game does not tell you about things like how to be proficient in those roles, passive bonuses of items, and weapons. Like Mrzwaznig said, buffing and debuffing is essential to proficient play, but you’re never taught how much buffs like Bravery or Faith raise your strength or magic, and with debuffing, you never learn how much Deprotect and Deshell lower your enemies physical and magic defense. You don’t know how long these buffs and debuffs stay on for, what their success rate is or how much damage they will do. This is also where taking into consideration who your party leader is can make a huge difference. Most people make their party leader someone who will take the offensive role like Commando or Ravager, but it may be more effective to take a supportive role. For example, let’s say you’re at the end of the game and Sazh has all 6 ATB gauges. Each buff from a Synergist takes up 2 ATB gauges, but when a party member other than your leader is casting buffs, they will do one at a time. This can be incredibly slow considering that when the party leader is a Synergist, you can cast 3 buffs at a time. It would only take a few seconds to apply most of the buffs available, thus being much faster than letting a party member do it for you. This same issue goes for Medic and Sentinel as well. A.I. Medics will only provide one heal at a time when your health gets back to a certain threshold, whereas you as the party leader could apply 6 heals simultaneously and get your party member’s health up to full in a matter of seconds. It’s also much more beneficial for Sentinels to use Mediguard or Steelguard, but they only do so when their health is low. If your party leader is your Sentinel, you can use either move all the time, meaning you won’t need to be healed as often and can focus on attacking, buffing or debuffing. Each of these roles also has passive bonuses that they don’t tell you about. Just by having a Sentinel present while fighting, damage is reduced for your entire party. Having a Ravager present will boost the party chaining capabilities. Commandos raise the attack for all party members. The higher role level you are, the higher the boosts get and if you have multiple roles present at once, the bonuses are raised even more. FFXIII absolutely does not do a good job telling the player about all of these mechanics, because if it did, I feel like people would appreciate the combat a lot more. There is still so much I could get into such as accessories, weapons, and their passive abilities, but for the sake of time, and trying not to just solely talk about FFXIII, I thought it would be best to leave it. The combat is deep and the more the player wants out of it, the more they can get. The same cannot be said about FFXV. As much as I hate using this word, the combat for XV is just too “casual”. It’s easy, it takes no strategy, it’s too easy to spam dodge, potions and to just use super powerful attacks. When you boot up FFXV the message “A Final Fantasy For First Timers And Long-Time Fans” is displayed. but I just don’t think this is true, especially when it comes to combat. The characters have no defined roles, battles take no strategy, the game gives you so much money that item management is non-existent, and there is nothing close to anything resembling a job system. Even the leveling system is useless because it’s so easy to defeat high level enemies. This is one of the main reasons why I just never get the desire to play FFXV again, because just like in XIII, and most of the other games, all there really is, is combat, so it better be good. NijiBashira, another expert on FFXIII, does a great in-depth look on what makes combat in RPGs good, and how this pertains to XIII, I really recommend checking it out. Ladies and gentlemen, I know that it may seem like I hate FFXV, but that is not the case, I was just simply put, disappointed with a lot of aspects of it. For me, this game had everything going for itself. I love the look of it, the story, and I was very excited but tried not to hype myself up too much by watching every second of gameplay they showed. By the time I put in over 100 hours on my first playthrough, I was left unsatisfied and knew that I probably wouldn’t play a second time. This has never happened with a Final Fantasy game for me – I’ve played most of the games in the franchise multiple times and loved it. Now, when comparing this game to FFXIII, I tried to be as fair as possible. XIII is an incredibly flawed game. 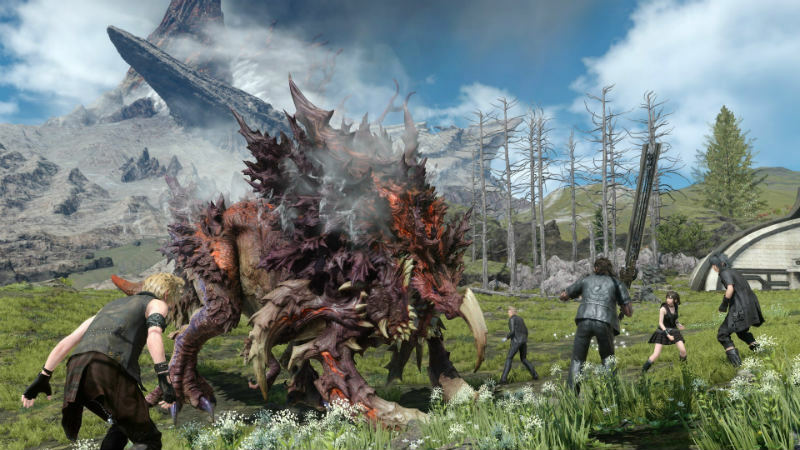 The game doesn’t always convey its story in the best way, it doesn’t have much side content, which is fair criticism for a Final Fantasy game, and the mechanics of combat are not explained to the player well enough. But compared to FFXV, I think I’ve done a good job pointing out that it is just as, if not more, guilty of these problems. The gameplay loop of XV is the complete opposite of XIII, being a massive open-world game, but the world is very empty. FFXIII does not always show the best sides of their characters, and they aren’t always written in the best literary sense, but once again, I conveyed how they are either not as bad as people make them out to be, or people just don’t understand their characterization. In terms of Hope and Snow, it’s not their characters that are bad, but how the writers conveyed their story to the player. Compared to 15’s main cast though, FFXIII’s cast is much more fleshed out, they have actual backstory, meaningful dialogue, and they engage with each other in actual conversations that have story relevance. Combat in FFXIII may be too plentiful, it may not be flashy or over the top, but it still takes much more strategy and forward thinking than XV’s combat. It was difficult, and the post-story battles were incredibly fun and hard to beat. RPGs are my favourite type of game and FFXV’s was probably one of the most thoughtless and boring combat systems I’ve ever played. You can dodge everything by just holding down a button, you can heal at any point and once the healing animation starts, your characters are invincible for the short period. MP can always easily be replenished and I don’t think I ever got a game over throughout my 100+ hour playthrough. Yes, Square Enix has made some quality of life improvements to FFXV since it came out but because of my initial bad time with it, I never wanted to go back. After paying almost 90 dollars for a game I was disappointed with, I didn’t want to pay for more DLC that clearly should have been in the main game. I would absolutely discuss everyone’s thoughts, so even if you completely disagree, let me know and I’ll talk about it with you. FFXIII will probably always be my favourite game, and I feel like I’ve defended it admirably. And remember, if you just can’t catch a break, there’ll always be a chocobo chick to cheer you on. Thank you so incredibly much for reading.